The Buffalo Bisons today announced that RHP AARON SANCHEZ and OF MELKY MESA have been promoted to the club from Double-A New Hampshire. The Blue Jays announced that they have released LHP RYAN ROWLAND-SMITH and traded OF MATT TUIASOSOPO to the Chicago White Sox for cash considerations. OF KENNY WILSON and RHP GREGORY INFANTE have also been transferred to Double-A New Hampshire. SANCHEZ, 21, is rated by Baseball America as the #1 prospect in the Blue Jays system. In 14 starts for New Hampshire, the righty is 3-4 with a 4.82 ERA with 57 strikeouts to only 52 hits allowed in 66.0 innings of work. Sanchez has allowed more than three earned runs in just one of his 14 starts. 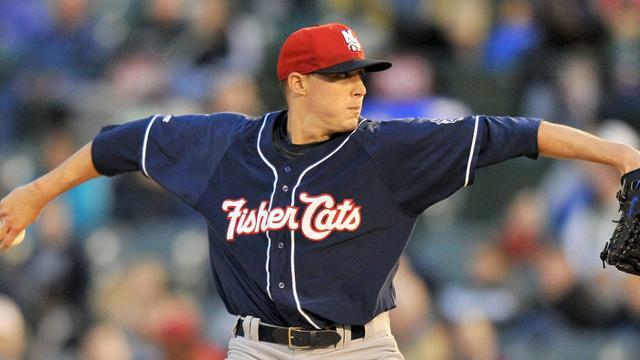 He struck out seven in each of his last two appearances with the Fisher Cats. Sanchez was the Blue Jays 1st round draft pick (34th overall) in the 2010 First-Year Player Draft. He went 4-5 with a 3.34 ERA in 22 games and 20 starts for Single-A Dunedin last season. Sanchez is scheduled to make his Triple-A and Bisons debut on Saturday, June 14 as Buffalo takes on the Mud Hens in Toledo (7:00 p.m.). MESA, 27, was acquired by the Blue Jays in a trade with Kansas City on May 26. In 10 games with New Hampshire since the deal, the outfielder has hit .304 (14-46) with three home runs, seven RBI and six runs scored. He hit a pair of home runs on June 5 against Bowie. Mesa spent most of last season with Scranton/Wilkes-Barre where he averaged .261 (82-314) with 15 doubles, 13 home runs and 39 RBI in 84 games. He also played five games with the Yankees in late July and had five hits in 13 at-bats (.385). Rowland-Smith was 1-0 with a 5.14 ERA in 12 relief outings for the Bisons (14.0 IP, 10 H, 11 SO). Tuiasosopo hit .206 (44-214) with eight doubles, two home runs and 18 RBI in 59 games. Wilson had posted a .263 (10-38) average with five RBI and four stolen bases in 13 games with the Herd. Infante was 2-1 with a 2.35 ERA in five relief appearances with the Bisons (7.2 IP, 2 H, 10 SO).